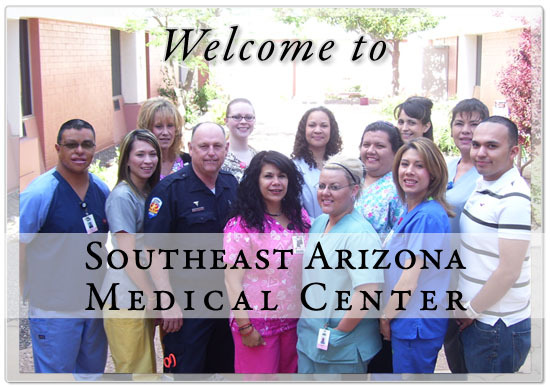 Southeast Arizona Medical Center: Welcome to Southeast Arizona Medical Center. Welcome to Southeast Arizona Medical Center as we celebrate turning 100 years old this year we look forward to the next 100 years of providing quality healthcare to the community. The advances in medicine and strides in technology are providing local communities access to better healthcare every day. Our associated staff will be here to help you and your loved ones when the need arises. The comfort, well-being and superior care of our patients is our goal. Please visit our website often to view all the new upgrades, services and changes that will take place. Our web site will provide you with the tools needed to educate and increase your health awareness. Our Healthcare Research Center will introduce health information and patient education resources for you to explore. Please explore our website and health information programming anytime you need additional information regarding you or your loved one's health. 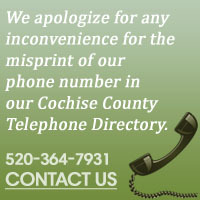 Please be sure to contact us if we can help you in any way. To provide Safe, High Quality Patient Care, Positive Education and Excellent Community Service. The vision of Southeast Arizona Medical Center is to be the leader in the southeast corner of Cochise County for health, wellness, and caring; and to reach out to our neighbors to the south for their health and wellness needs.